Children are generally safer on the rear seats than on the front passenger seat. In contrast to adults, the muscles and bone structure of children are not yet fully developed. Thus children are exposed to increased risk of injury. Children should be transported in accordance with the relevant statutory provisions. Child seats that comply with the ECE-R 44 standard must be used. The ECE-R standard stands for: Economic Commission for Europe - Regulation. Child seats that comply with the ECE-R 44 standard have a test seal that cannot be removed: a large E within a circle with the test number below. The national legal requirements must be observed when using child seats. One should never carry children, and also not babies! - on one's lap. The child must be secured in the vehicle throughout the journey. Otherwise, in the event of an accident, the child would be thrown through the vehicle and as a result may suffer fatal injuries, and also injure other occupants. Children are exposed to an increased risk of injury in the event of an accident if they lean forward or adopt an incorrect seated position when the vehicle is moving. This particularly applies to children who are transported on the front passenger seat as they can suffer severe, or even fatal injuries if the airbag system is deployed! Pay particular attention to the information provided by the manufacturer of the child safety seat regarding the correct routing of the belt. Seat belts which are not correctly adjusted can themselves cause injuries even in minor accidents. Safety belts must be checked to ensure that they are running properly. One should also ensure that the belt is not damaged by sharp-edged fittings. It is essential to switch off the front passenger airbag if using a child seat on the front passenger seat in which the child is carried with its back facing the direction of travel. Further information » page 20, Use of a child seat on the front passenger seat. We recommend that you use child seats from ŠKODA Original Accessories. These child seats were developed and also tested for use in ŠKODA vehicles. They meet the ECE-R 44 standard. Never use a rearward-facing child restraint system on a seat which is protected by an active airbag installed in front of it. This could cause serious injury to the child, even death. Fig. 13 Sticker on the B column on the front passenger side. For safety reasons, we recommend that you install child seats on the rear seats whenever possible. The following advice must be heeded when using a child seat in which the child is carried on the front passenger seat. Adjust the front passenger seat back as vertically as possible so that there is firm contact passenger seat back and the child seat back. Where possible, move the front passenger seat back so that there is no contact between the front seat and the child seat behind. In the case of Group 2 or 3 child seats, make sure that the deflector pulley mounted on the child seat headrest is in front of or level with the pulley on the B-pillar on the passenger side. Set the height-adjustable front passenger seat as high up as possible. Set the front passenger seat belt as high up as possible. Place and fasten the child seat on the seat and the child in the child seat according to the specifications in the manufacturer's user manual of the child seat . It is essential to switch off the front passenger airbag if you are using a child seat on the front passenger seat in which the child is carried with its back facing the direction of travel » page 17, Deactivating airbags. Never use a child safety seat on the front passenger seat in which the child is seated with its back facing the direction of travel if the airbag is switched on. This child safety seat is positioned in the deployment area of the front passenger airbag. The airbag may cause the child severe, or even fatal injuries, in the event of it being deployed. This fact is also indicated by the label that can be found in one of the following locations. On the B-column on the front passenger side » Fig. 13. The sticker is visible when opening the front passenger door. On the front passenger's sun visor. In some countries, the sticker is located on the front seat passenger's sun visor » Fig. 14. The front passenger airbag should be switched on again once the child seat, in which the child is transported with the back to the direction of travel, is no longer in use on the passenger seat. 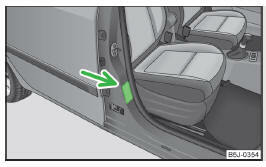 The child must not be positioned in the area into which the side airbag will deploy » Fig. 15 - A. There must be sufficient room between the child and the area into which the side airbag will deploy to allow the airbag to provide as much protection as possible » Fig. 15 - B. Children must never be seated with their head in the deployment area of the side airbag – there is a risk of injury. Do not place any objects within the deployment area of the side airbags – there is a risk of injury. Classification of child seats according to the ECE-R 44 standard. 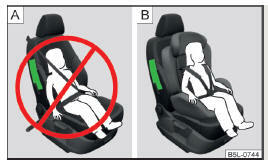 Overview of the use of child seats fastened with a seat belt on each of the seats in accordance with the ECE-R 16 standard. “Universal” child seat category - a child seat designed for fastening on the seat with the seat belt.